It's alright recording lots of figures which show the variations in the soil but unless you know where the changes are in relation to one another, all you've got is a meaningless collection of numbers. Even if you can sort out the data in one survey you will probably need to relate it to the next, and if you contemplate digging a hole you need to be able to pinpoint where the interesting points are. Have a look at the site and decide where you want to survey and if you potentially want to do more, think about how that would fit in. When you've decided on your first survey area (grid) and it's size, put a peg in the ground at one corner. Make sure you will be able to find this again by measurement to fixed points or some other means. Fix a tape to this peg and run it out along one side of your first grid. 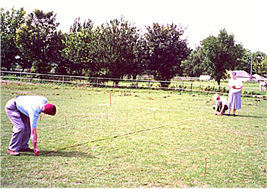 At the correct distance, with the tape tight, put another peg in the ground to form a baseline. Make a square based on your baseline (eg 30m) by invoking Pythagoras - in other words use another tape to measure the square root of 2x baseline length from the first peg (eg 42.42m), and one baseline length from the second peg (eg 30m). Put the third peg in where these two cross with the tapes straight and slightly tensioned. (10m baseline -14.14m; 20m 28.28m; 30m 42.42m etc). Reverse the tapes on the first two pegs and put the fourth peg in where the tapes cross. If you have any doubts measure the distance from the fourth peg to the third - if its not the same as the baseline length you've gone wrong! At least two of the pegs should, if at all possible, be measured from two fixed points such as a telegraph pole or key fence post so you can find them again much later. Record as much as you can about the spatial arrangements - you might not get access again! Any measurements you make can now be referenced to your baseline, and any additional grids can be generated using the same method from any two adjacent pegs. It gets slightly more complicated if you choose a rectangle rather than a square but Pythagoras gives you the diagonal lengths to use; [square root of (the square of one side plus the square of the other)]. For ease of measurement most people do a zigzag pattern of data collection working clockwise. In other words starting from one corner, record data parallel to the side of the square until you reach the end, then turn around and face the direction you've just come from, move a metre or other set distance from where you ended, and record data back to your starting line always moving parallel to the sides of the square. It makes life a lot easier if you have tapes, lines or even markers that guide you where you are going as you move along the starting line. 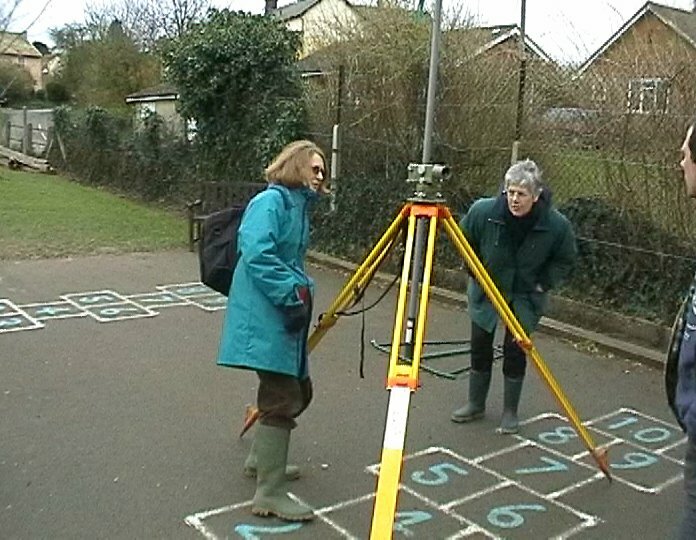 If there isn't an adequate plan of the site available, you may need to do a physical survey using, at the simplest level, an alidade and plane table, or getting more complicated, a theodolite or level. Professionally, or with lots of funds, you might use a Total Station. Whatever kit you use, you need someone who can hold the pole, and someone who can work the device.